Carlton Lanes Shopping Centre01977 603338work Shopping CentreCarlton Lanes Shopping Centre has over 45 stores and is the prime shopping centre for Castleford. It is in an ideal location for both residents and visitors to Castleford, with excellent motorway and public transport links. You are sure to find what you want in Carlton Lanes Shopping Centre and with its varied style of shops every member of the family will enjoy the shopping experience. Aire Street and Bridge Street car parks support Carlton Lanes Shopping Centre with approximately 300 plus spaces including a number of disabled bays. Carlton Lanes offers baby change facilities, toilets and a separate toilet for disabled shoppers. The centre offers a free hire of mobility scooters and wheelchairs. Contact centre staff to arrange hire prior to arrival to avoid disappointment. •Telephone – low level for disabled use. 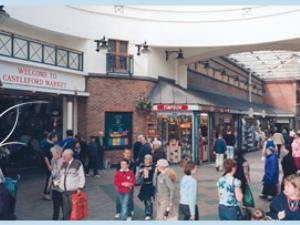 Carlton Lanes Shopping Centre has over 45 stores and is the prime shopping centre for Castleford. Follow sings for Castleford town centre.